Opened in July 2008, this beautiful Bed and Breakfast boasts contemporary styling in an inn-like setting. Bright, clean and tastefully decorated rooms will ensure a pleasant stay. 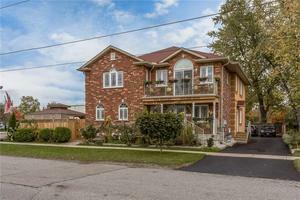 Two Rivers Bed and Breakfast is nestled close to the junction of the Niagara and Welland Rivers, offering an abundance of regional activities to stimulate all travellers. Whether your interests are focused on visiting Niagara Area Attractions, taking part in Recreational Activities or just allowing yourself a well deserved rest, Two Rivers Bed and Breakfast is the place to be. Your host, Emina is excited about her new Bed and Breakfast and look forward to welcoming you personally. Your host, Emina welcomes you to Two Rivers Bed and Breakfast. Your stay will be enhanced by a gourmet breakfast prepared in our commercial kitchen. Dietary restrictions and health benefits will always be considered. 1. Homemade Granola and Yogurt 2. Fresh Juice and Coffee or Assorted Teas 3. Fresh Fruit 4. Choice of Hot Entree 5. eggs (any style) 6. fresh cut home/french fries 8. pancakes 9. omelette's 10. vegetarian 11, gluten free 12. glucose free * Also we offering picnic lunches and evening meals. * Try our homemade breakfast breads and evening pizzas from our pizza oven in our commercial kitchen. This beautiful accommodation is wonderfully decorated in various light blue colours that will send you in a deep state of relaxation. The room is equipped with a private 3 pc. bathroom, TV/DVD, bar fridge and a queen size bed. We hope that you enjoy it. The Amber Room is a very modern and classy accomodation. The room is decorated in a very modern and classy style. The floors consist of dark hard wood and ceramic tiles. The room has it's own private 3 pc. bathroom. TWO RIVERS B&BThe B&B is only 2 years old and it prides it self in modern style and cleanliness. The B&B has a private parking lot at the back which can comfortably accommodate all of our guests. The B&B also has a handicap ramp and a separate handicap bathroom outside of the room area. This room is a blue colour which projects the feeling that you are floating among the clouds in the sky. This has been referred to as the most relaxing rooms due to the mood set by the color accents and the style. The room is equipped with its own private bathroom which is decorated to match the style of the room it self. The kitchen is fully equipped with all new appliances. The kitchen contains a stove, microwave oven, dish washer, fridge, and dishes. The kitchen is modern and it has ceramic floors and back splash. -The Sapphire room has its own private 3 piece bathroom as do all of our rooms. The bathroom floors and walls are covered in beautiful ceramic tiles. Each bathroom is decorated to match the style and colour of their rooms. This room is one of our smaller and most affordable rooms. Our guests find it extremely cozy and relaxing. The room is equipped with its own 3 pc. bathroom, Double Size bed, bar fridge, TV/DVD. Ceramic and Hard wood floors. The walls are painted in a off shade relaxing green colour. The Sapphire Suite includes a queen size bed with an orthopedic mattress, two oak nightstands, a small seating area, and a large closet. The interior décor combines several cool shades of emerald blue with dark hardwood flooring and abstract blue and beige porcelain tiles, creating a sense of calm and tranquility. The bedding is 100% cotton, and extra pillows and covers are available, upon request. This suite also features a large closet, perfect for keeping your clothes and storing your luggage. The bathroom is spacious, also decorated in a blue color scheme, and porcelain tiles, including a full tub, toiletries, hair drier and plenty of towels. This suite is equipped with all the amenities to ensure your outmost comfort, including a flat screen TV with cable, free WIFI, fridge, and a table with two chairs. In addition, this suite is equipped with a coffee maker/tea kettle, and complementary coffee, tea and bottled water. 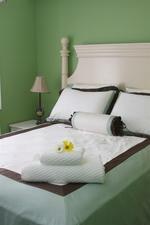 The Two Rivers B&B is wheelchair accessible and is equipped with handicapped accessible washroom. Our premises are smoke free and pet free, parking and high speed WIFI are included. We also feature a large indoor dining/breakfast area, and plenty of outdoor patio space. Bathroom Description: The bathroom is spacious, also decorated in a blue color scheme, and porcelain tiles, including a full tub, toiletries, hair drier and plenty of towels. The Amber Suite features a queen size bed with an orthopedic mattress, two night stands, a seating area, and a large closet. The interior décor of this suite is based on the amber color scheme: yellow, orange and red, to create a sense of warmth and serenity. Dark hardwood and porcelain tiles are set throughout the suite and bathroom, adding to the beauty of this suite. The bedding is 100% cotton, and extra pillows and covers are available, upon request. This suite also features a large closet, perfect for keeping your clothes and storing your luggage. The bathroom is set in porcelain tiles and decorated beautifully, it includes a full tub, toiletries, hair drier and plenty of towels. 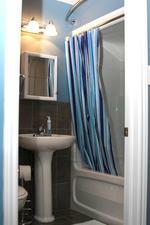 The Two Rivers B&B is wheelchair accessible and is equipped with handicapped accessible washroom. Our premises are smoke free and pet free, parking and high speed WIFI are included. We also feature a large indoor dining/breakfast area, and plenty of outdoor patio space, perfect for enjoying your breakfast. Bathroom Description: The bathroom is set in porcelain tiles and decorated beautifully, it includes a full tub, toiletries, hair drier and plenty of towels. The Topaz Suite features a queen size bed with an orthopedic mattress, two nightstands, a seating area, and a large closet. The interior décor combines the lustrous golden and orange colors of imperial topaz and forest green, with dark hardwood flooring and beautiful porcelain tiles. The Emerald Suite includes a queen size bed with an orthopedic mattress, two nightstands, a small seating area, and a closet, and en suite bathroom. The interior décor combines hues of lush emerald green with dark hardwood flooring and abstract green and beige porcelain tiles. The unique color combination of emerald and jade greens enhances relaxation, creating an ambiance of tranquility. The bedding is 100% cotton, and extra pillows and covers are available, upon request. This suite also features a large closet, perfect for keeping your clothes and storing your luggage. The bathroom is spacious, also decorated in a green color scheme, and porcelain tiles, including a full tub, toiletries, hair drier and plenty of towels. Bathroom Description: The bathroom is spacious, also decorated in a green color scheme, and porcelain tiles, including a full tub, toiletries, hair drier and plenty of towels. The bedding is 100% cotton, and extra pillows and covers are available, upon request. This apartment also features two large closets, perfect for keeping your clothes and storing your luggage. This apartment is equipped with all the amenities to ensure your outmost comfort, including a flat screen TV with cable, free WIFI, fridge, and a table with two chairs. In addition, this apartmentis equipped with a coffee maker/tea kettle, and complementary coffee, tea and bottled water. This spacious suite has 3 separate bedrooms, 2 bathrooms, fully equipped kitchen and living room with large TV. It also features bedding with handmade linens and silks. Please note that the room rate is for the 3 rooms and is based on 6 guests. Maximum occupancy is 6 guests (see Hotel Policies).